Today Savient Pharma (SVNT) announced the initial shipment to specialty distributors and pricing of KRYSTEXXA. These are two major milestones for a biotech stock basically left for dead by the market after a failed auction process back in late October. Now the key will be how many vials of KRYSTEXXA at $2,300 a pop SVNT will be able to sell with a limited salesforce. Considering they had thousands of people wanting sign up for trials and those people are desperate for the drug the sell shouldn't be that hard. If you have been suffering from gout without any relief from existing drugs, this product should be able to sell itself. And that assumes the cost won't continue to drop. The Trouble Asset Relief Program (TARP) continues to be scorned by most people costing many backers their political positions, but ironically it has turned into one of the most successful government programs ever. Ok, its very possible that the politicians lost their jobs due to the numerous other packages enacted after TARP that weren't nearly as successful. Anybody hear of any benefits from the stimulus package? 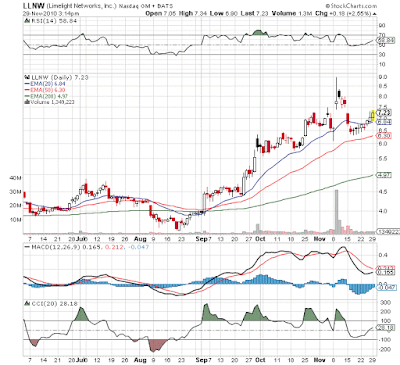 Added Limelight Networks (LLNW) to both the Opportunistic Long Only and Opportunistic Levered portfolios. LLNW is a play on a faster internet and the potential for being the next Akamai (AKAM). Unfortunately it could be the ugly sister in that competition and thats never good for a stock. Some news today that triggered the move other then technical was the news that fast growing deal of the day company Groupon announced that they are using LLNW and have seen substantial improvement in their website speed. They also recently expanded an agreement with Netflix (NFLX). Both companies are at the leading edge of the web so its crucial that LLNW win these deals. Though the question remains whether LLNW can start making money on all these deals. Thats where the ugly sister typically comes into place. Sure they'll get dates, but its usually when the pretty sister is too busy or too demanding. The stock will soar if any of these new deals start dropping to the bottom line. TheStreet.com interviews Joe Giamichael, managing director and head of China research at Global Hunter Securities, about his bull case for the recycling sector in China. A couple of stocks that we follow in the recycling area include Lihua International (LIWA) for copper and China Aramco (CNAM) for iron ore. Along with Stone Fox Capital, Joe is bullish on LIWA. He provides some great details on the discounts for scrap copper and how cheap the stock remains. CNAM continues to be a play that we follow though it continues to struggle with its recycling facility. The second of three models is now live on Covestor.com. The second model is the Net Payout Yields portfolio that focuses on SP500 stocks with large net payout yields which are the combination of dividends and stock buybacks. Companies with the highest yields have historically outperformed the market by a large percentage with no additional risk then investing in an SP500 index fund. This model requires a $5,000 investment and charges 1.1% pa. Also, in order to sign up with Covestor it requires $10,000 to establish an account via Interactive Brokers. Then your able to diversify that $10K with multiple models via the $5K investment or just one model. So even with only $10K you can have 2 models replicated. Great opportunity to diversify. Last night Atwoods Oceanics (ATW) reported Q3 results of $.99 that easily surpassed the estimates of $.92. Revenue came in slightly ahead of expectations all suggesting the stock would pop today. Well, evidently the huge 3 month gains and possibly a better understanding by the market that 3 rigs were cold stacked caughtt the street off guard. As far back as the end of October, ATW had made it known that three of the lowest specification rigs, Southern Cross, Seahawk, and Richmond, had been cold stacked. Maybe it caught Wall Street off guard that they don't expect any deals near term as they aren't even actively marketing the rigs. Some analysts only get news from the quarterly earnings reports and calls so maybe this was the first time getting the official word. Anybody that has followed this blog or follows my trades over on Covestor.com has probably noticed the names I use for the different portfolios that I track. When I originally started tracking these portfolios, the typical names were either growth or value, domestic or international, small cap or large cap, etc. More good news from Terremark Worldwide (TMRK) on landing the Federal Communications Commission (FCC) for their Enterprise Cloud platform to support its strategy to leverage cloud computing, including the agency's plan to host its web site in the cloud. This is yet another sign how the governments need to cut budgets either forces them or makes it more likely that they'll move more services online and ultimately into the cloud. Where they might have been more reluctant in the past to outsource into the 'cloud' it now makes economical sense and the lower costs are out ruling any concerns on security. TMRK is a proven government provider and a leader in the federal market. Look for more and more government agencies to move not only online but to the cloud via TMRK. FCC.gov is yet another feather in their hat. TMRK remains a core holding of the Opportunistic Portfolios including the Long Only and Levered. So much for that much bally hooed double dip recession. The Philly Fed Index for November came in at a surprisingly rich 22.5 up from a 1.0 in October. It was also much higher then the 5.0 consensus estimates. The 22.5 reading was the largest number since last December. Leading the way were huge increases of 15 points in new orders and shipments. The main negative continues to be higher input prices due mainly to the sharp rise in commodity prices. Inventories saw a big jump of nearly 13 points, but the overall number remained a -5.9 still showing that for the most part manufactures maintain very lean inventories. Hence, the likely huge jump in orders. Firms continue to underestimate the strength of this recovery. Bought some more stock of Regions Financial (RF) in the Opportunistic (Long only) portfolio. Only had a 2% position and I doubled it to roughly 4% to bring it in line with the position weighting in the newly started model on Covestor.com that will be launched to the public in about a month. RF was down some 9% at one point today after announcing management changes in the credit risk department. Naturally the stock dropped on news of a shakeup in management especially with several individuals 'retiring' in one department . I'm sure most sellers assumed more bad news on the way or possibly even some yucky fraud situation. (ok its not that natural to always shoot first without understanding the news but thats how the market works). Whats so bad about the Chief Risk Officer and Director of Credit Risk leaving when they were the risk leaders when the problems occurred? What risk did they help mitigate anyway? Dicks Sporting Goods (DKS) remains one of the best retailers around. As they continue to expand their US footprint they can market share and have become the 80lb gorilla in the sporting goods sector. Heck, I'm a big investor in DKS, but I still can't even shop at their stores other then Golf Galaxy. DKS reported Q3 earnings of $.22 that beat estimates of $.17 and above the $.16 from last year. Same store sales jumped by 5%. Much better then the 1-2% they forecast showing that management continues to UPOD (under promise, over deliver). DKS also guided up for the full year and Q4 stating that they expect strong demand in Q4. The top retailers continue to perform in evident ignorance that the economy is suppose to be weak. Apparently though, good retailers aren't short of shoppers. DKS will remain a core holding of all the Opportunistic Portfolios (Long only, Levered, Hedged - more to come on name changes). Does the Dow trading at 15,000 sound crazy? That's probably the general consensus in the market these days. The Dow currently trades at 11,201 at the close today. A 3,800 point jump to get to 15,000 amounts to a 34% gain. What's interesting about he concept of the market currently being worth X amount higher or the future value hitting X in a year is that the market commentary is almost completely void of future predictions with the market higher. It's very bullish to turn on the TV or pull up a blog and see the latest prediction of the SP500 plunging to 900 or 600 or even lower. After a decade of the market being basically flat (ok it was very volatile in that period), most market pundits seem fixated that the market won't ever go higher. Corporate earnings have peaked if you listen to them. Heck, if you had listened to the pundits corporate profits would've never rebounded so sharply. As the largest shareholder of Bucyrus (BUCY), Terex (TEX) is a big beneficiary of the buyout of BUCY by Caterpillar (CAT). TEX owns 5.8M shares now worth over $500M. Not only do they get the appreciation from the 30% gain today, but more importantly TEX gets to cash out their shares that they acquired via the sale of their mining division to BUCY at a premium. Having the $500M in cash on hand is a lot more valuable to them then stock in BUCY. 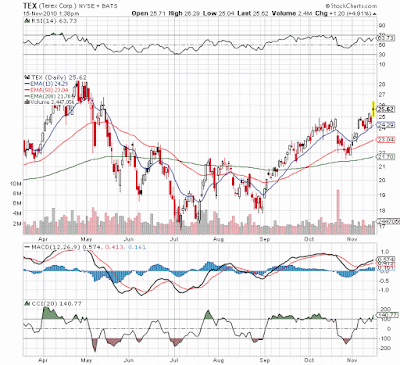 TEX provides one of the best stock picks for the global rebound. At $25, TEX provides one of the few remaining stocks that hasn't rebounded. The stock still remains roughly 75% below 2008 highs while some stocks have already eclipsed those highs ala BUCY. The crane industry is still struggling to recover from the financial crisis, but signs are emerging that 2011 will the recovery year and TEX likely plays catchup with the market. More reports over the weekend of companies lining up to bid on Massey Energy (MEE). 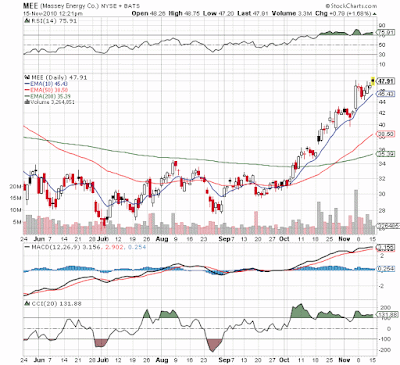 MEE has reportedly been on the auction block for a month now with rampart reports from Alpha Natural Resources (ANR) buying the company to Coal India buying a mine. Neither make much sense considering the size of ANR and lack of benefit to MEE from selling just one mine. MEE has been struggling under higher scrutiny and regulation since the explosion at the Upper Big Branch (UBB) mine back in April. The benefit to suitors is that MEE has the largest reserves of met coal needed for the production of steel in the US. With reserves of roughly 1.3B plus another healthy 1.5B of thermal coal, MEE offers a plethora of valuable assets to potential suitors, Considering the combination of management under attack and valuable assets, its no surprise that the acquisition news is heating up. Don't post daily results that often, but it's worthwhile to point out days were our portfolios end up positive and the market is very negative. These are the days were the outperformance or alpha of this portfolio really takes shape. More importantly it isn't achieved by being short the market. Below is the results from the Growth Portfolio as tracked by Marketocracy.com. Beat the SP500 by 0.67%, but more importantly SFCG was up 0.25% on a broadly negative day. The Opportunistic Portfolio was up a more impressively 1%+, but unfortunately I don't have a way to post those results on a daily basis. Note the columns are shifted over one column. The 0.25% should be under the 'Today' column. Please contact me at stonefox27@ymail.com with any questions about investing in these portfolios. Prior to the open today, Lihua International (LIWA) posted earnings that beat analyst expectations. With only a couple of analysts following LIWA, that generally isn't that worthwhile. While news that the company is upping full year guidance and that they see strong demand in 2011 is extremely useful. LIWA reported revenue of $96.3M which was 135% over last year. EPS was $.33 versus $.13 last year. Margins were lower due to the new copper anode products having lower margins but they provide a higher return on invested capital leading to a larger bottom line and huge growth opportunities. While the markets focus on just the oil/crude inventories, it's more important to look at the gasoline and distillates as well. The market expected a net 2.1M decline. Instead the inventories plunged by 10.2M barrels. Thats a major decline and much, much higher then expected. The market will typically just focus on the major miss by the headline grabber crude. Losing 3.3M barrels versus the expected gain of 0.8M barrels was a substantial miss in it's own right. Still petroleum inventories and especially crude remain at very high levels. See info from Bespoke. Though its very key to note that these graphs show average numbers for the last 20-30 years when storage facilities and demand was lower. With gasoline and distillates plunging at an alarming rate, look for the next few reports to be critical to whether the inventory trend is finally much lower. If so, energy demand might finally be placing supply questions into the forefront. Typically I don't post videos of companies that are mentioned on TV, but its rare to see somebody talking about one of the small caps that we own. Puda Coal (PUDA) is a leading coal mine consolidator in China and met coal washer. Last night on CNBC Aisa, the CEO of Pacific Sun Investment Management did a great job of discussing the bright future of PUDA. As he mentions, PUDA remains a very cheap stock even with the huge run the last month. PUDA is a top pick in both the Growth and Opportunistic portfolios. Earnings will be on Friday and we're looking forward to hearing about the mine consolidation process. Bought Chubb Corporation (CB) today for the Net Payout Yield Portfolio. CB has a current yield of 13.6% based on a 2.5% dividend yield and 11.1% buyback yield. More importantly CB has been more aggressive in the last 6 months on the buyback leading to an attractive investment potential. CB provides property and casualty insurance for both business and individuals. Interestingly insurance companies seem to have the best yields these days whether via Wellpoint (WLP) in health insurance, Medco Health Solutions (MHS) in pharmacy benefits, or CB in property and casualty insurance. CB is the only one of the three with a dividend that has the 10%+ yields in the insurance sector.